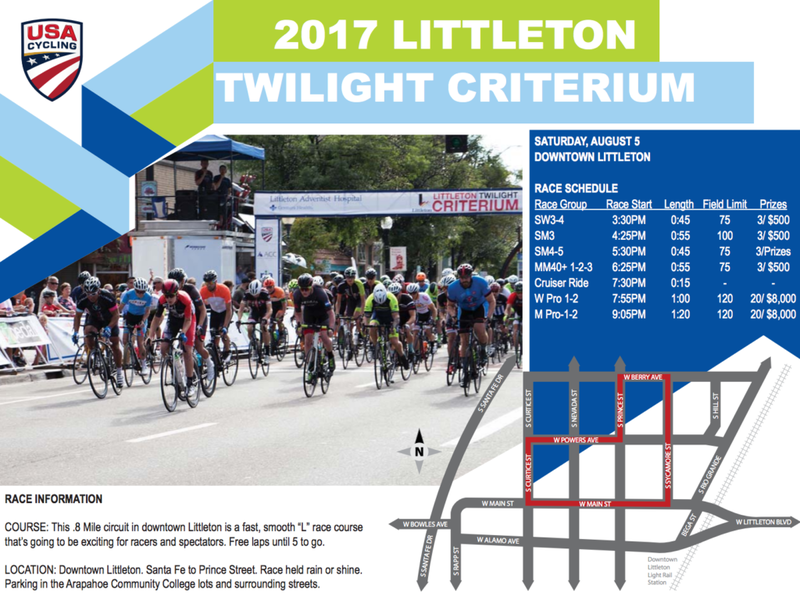 The Littleton Twilight Criterium is back for its fifth year! It’s a free festival atmosphere featuring food, a beer garden, kids activities and live music on the streets into the evening. A “criterium” race is defined as a timed circuit around a short, technical course. Spectators can watch the racers fly by the 0.8-mile course at nearly 30 mph! The event is part of USA Cycling’s National Calendar. There will be six total races, highlighted by the Men’s and Women’s Professional races under the lights. The festive beer garden will be located on Prince Street complete with lawn games and craft brews from our partners at Breckenridge Brewery. Public parking is available at Arapahoe Community College Parking Lot B and at the Littleton Center. Shuttles will be running between these two lots and the race course every few minutes. Parking also available at the Arapahoe County lots at Crestline Avenue and Prince Street. Velorama Festival and Colorado Classic in Downtown Denver on August 11-13.